Ancient Germanic tribes such as the Goths, other Nordic peoples, Celts, Romans, Greeks, Arabs, Chinese and other peoples valued amber for it's beauty, protection and healing properties. Amber was also called Electra, Bernstein or Northern Gold due to its electrical properties and golden color and was traded far and wide in the ancient world. Amber is a powerful chakra cleanser and healer. At a physical level, is imbues the body with vitality and has the power to draw disease out of the body. By absorbing pain and negative energy, amber allows the body to rebalance and heal itself. Amber alleviates stress. Wearing baltic amber close to the skin is a traditional European remedy for baby teething. A natural analgesic, amber will help calm a baby without resorting to drugs. Used for centuries in Europe, amber's natural anti-inflamitory and pain relieving properties are perfect to soothe teething babies. 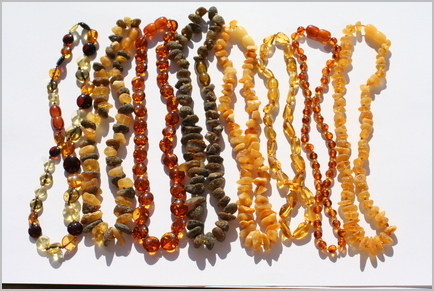 Amber is fossilized resin, which warms against the skin, releasing it's theraputic properties safely and naturally. Kindly email us prior to placing order to review product selection, custom text to be written on favour or invitation, delivery an or pick up details as well as additional service you may require.